This week in math class I have learned how to FOIL when multiplying polynomials as well as using an area diagram. FOIL is a distributive technique when multiplying polynomials together. You are taking and multiplying it with the other in the other bracket which will then give you because you add the exponents when the bases are the same during multiplication. You have to make sure to multiply the first term with the other term as well, everything that’s inside the other bracket, so in this case, will be multiplied with (-8) which will be . You are now left with . You have multiplied the first term with everything in the other bracket and the inside term with the other term, you now need to do the same for the outside term. In this case, you now need to multiply 8 with which will give you . Then you multiply 8 with the second term in the other bracket. Now put all the terms together in descending order by the exponents and collect like terms if needed. This is Foiling but I learned a quicker technique that you can use depending on each equation. The hardest part of this lesson was when I had to find the area of a rectangle/square when it had empty areas, so you had to find out the angles by subtracting then multiplying and other steps which was a little confusing. But I will keep practicing these equations. This week of math class, I’ve learned how to find the volume and the surface area of prisms, cones, pyramids and spheres, as well as learned some new formulas that I can use. Right here I am looking for the volume and surface area of a prism. 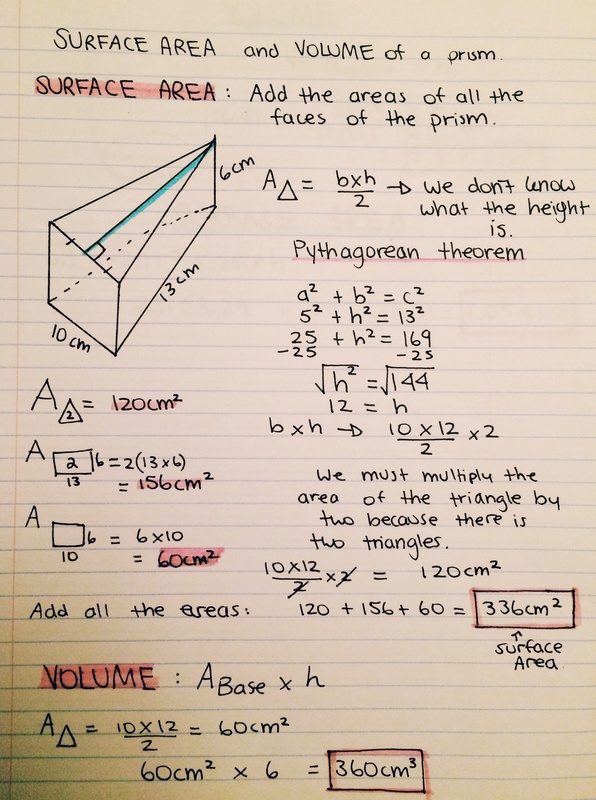 In this example, I needed to use Pythagorean Theorem because the height length was not given to find the area of the triangular base.The idea of Surface Area for prisms is to add all the areas of the surfaces/faces. The most challenging part about learning this lesson was finding the Surface Area because it requires a lot of steps and you can accidentally make a small mistake which changes the answer completely. This week we learned quite a few things I’ve learned from Imperial and SI systems. I’ve learned more different conversions in measurements such as converting from feet to miles and meters to yards. I’ve also learned how to read a vernier caliper in Imperial and metric units and how to read a micrometer in metric units.When you are given multiple measurements, sometimes you have to do multiple conversions because some of the conversions are not given. For example meters to feet. You have to go through multiple conversions, meters to centimeters then to feet. This week I learned how to calculate an angle using trig functions such as sin,cos, and tan. Here is a 2nd method to find LCM. That I used in kumon. List the multiples of both numbers until you see a common one. List all the factors until the both numbers have the same factor. The GCF of 104 and 320 is 8. Personally I prefer the prime factorization method then these two,because it will take a long time to do these two methods with big numbers.